Ringo flicked cigarette ashes onto a table top and ruminated about life. George discussed vegetables and meditation. Paul mused about history's way with fame. Three of the four Beatles turned up Monday to chat with newsmen and photographers following a private screening of the Beatles' movie "Yellow Submarine." John Lennon was officially "out of town." "I don't know where John is," said Ringo Starr. Neither did Paul McCartney or George Harrison. John was the Beatle most everyone hoped to see. Lawyers for Lennon and his wife are conferring about their marriage breakup. Lennon last week proclaimed he was in love with Yoko Ono, a Japanese sculptor, and said his six-year marriage of Cynthia Lennon was "over but not legally." Miss Ono, married to American film director Anthony Cox, is noted for her avaunt-garde movie of 365 naked human posteriors. 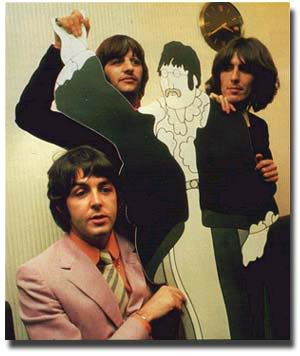 The Beatles had little to do with "Yellow Submarine" aside from contributing their recordings of the 12 songs it features. Voices not their own are used in the spoken portions of the 85 minute animated film in which the Beatles, through their music, save a country called Pepperland from the scourge of music-hating "Blue Meanies." The movie premiers in London this week. "We didn't make it" said Paul with a grin. "You can't blame us if it flops -- which it won't." Ringo, wearing a black Edwardian coat over a red and white polka dot shirt with frilly front, talked with a cigarette in one hand and glass of bitter lemon with ice in the other. His upper lip bore the beginnings of a new mustache. "If you treat everyone as if you ;re going to die in a hour, you're all right," Ringo told a captivated young woman reporter asking him about his attitude toward life. "Maharashi Mahesh Yogi is a nice fellow but we don't go out with him any more," quipped Paul in explaining the Beatles were still keen on transcendental meditation - but not with their former guru. Could anyone tell me the date (the day and month in 1968) of, and in what publication(s), this piece originally appeared ?